First Meetings of 2016 Announced! Our dedicated committees have been busy during our winter break. Our first three meetings of 2016 are planned and on the calendar! Here’s what is coming up in February, March and April: Low-Maintenance Gardening with Native Plants Epimediums: Jewels of the Shade Healthy Soils = Healthy People Get the details on the upcoming events list! 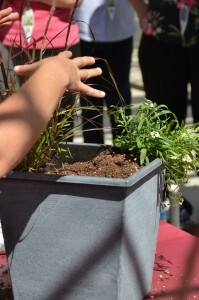 On Saturday, August 15th, we met for our Annual Container Contest and a presentation on herbs by member Jen Mitton at the farm belonging to the Hillside School in Marlborough where Jen is the Farm Director and Educator. Would you like to win a $50 Weston Nurseries gift card? The Gardeners Exchange 2015 Container Contest is right around the corner! Judging will be held during our August 15th meeting “Herbs: How to Grow & Use” which will be held at the Hillside School in Marlboro. If you would like to enter the contest, now is the time to get started!